Find X (formerly called as histograms) is a feature enabling you to see additional information in word sketch results. This information provides more details about the use of the word, e.g. noun people is usually used in plural. 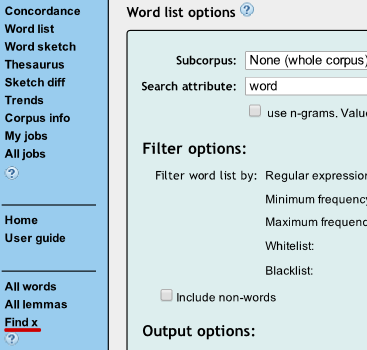 Find X (word sketch highlight) can show differences in word usage such as grammatical numbers (singular vs plural), text types (written vs spoken), grammatical cases (simple vs continuous vs passive), etc. Find X can be defined in three ways. (Q1) In this scenario, the frequency of the pattern specified by the CQL, with the word substituted at %s in Q1, is divided by the frequency of the word. (Q1 and Q2) In this scenario, the frequency of the Q1 query (with the word instantiated at %s) is divided by the sum of that same frequency and the frequency of Q2 (with the word instantiated at %s). (WS) Here the frequency of the word in the word sketch grammatical relation is divided by the frequency of the word in the entire corpus. How to use the Find X function? This is a facility available from the left submenu in the word list feature and related to the use of word sketch highlights in Sketch Engine. Additionally, a regular expression (RE) can be specified for removing some words from consideration. Only the words matching the RE are considered. This is mainly for efficiency reasons. Examples are attached. 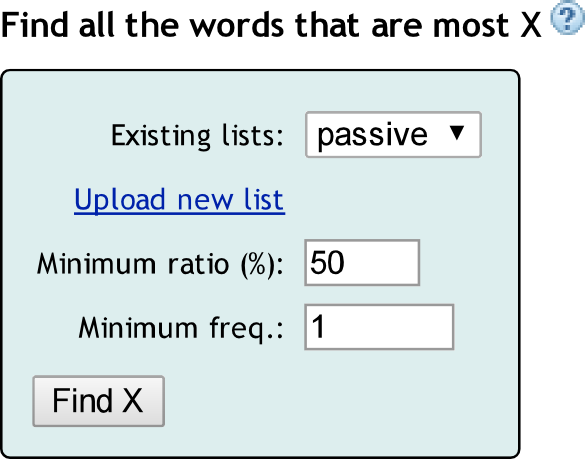 Note that you may need to alter the minimum ratio and minimum frequency to see any results. # All strings in the definition files starting with # are comments and are ignored to the end of the line.